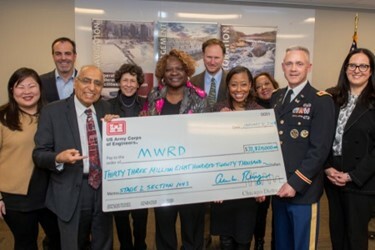 A pilot program by the United States Army Corps of Engineers (Corps), which has never been used by the Corps before, will grant the Metropolitan Water Reclamation District of Greater Chicago (MWRD) the critical funds it needs to complete the final chapter of the famed Tunnel and Reservoir Plan (TARP) that protects and improves the quality of area waterways and reduces flooding. Thanks to the support of the Corps’ Chicago District and the Illinois congressional delegation, the MWRD has secured $33.8M to help complete McCook Reservoir Stage II. This lump sum payment to the MWRD came as a result of a pilot program established under the Water Resources Development Act of 2014, which evaluates the cost-effectiveness and project delivery efficiency of allowing non-federal interests to carry out construction of projects for flood risk management. Following a signing ceremony held at the Corps’ Chicago District Office to formally mark the transfer of funds, the MWRD will assume responsibility for the design and construction of remaining elements of the McCook Reservoir Stage II. The pilot study will allow the MWRD to complete the reservoir work without having to seek federal funds each year as has been past practice. “We want to implement this pilot program with an organization that has the engineering, leadership, management and resources necessary to see this through. That organization is MWRD and the professionals that work there,” said Col. Aaron Reisinger, commander and district engineer of the Corps’ Chicago District. McCook Reservoir Stage I, which was completed by the MWRD and the Corps in December 2017, can hold 3.5 billion gallons. McCook Reservoir Stage II will hold another 6.5 billion gallons and will be in service by 2029. Stage II of McCook is currently being mined and is more than a quarter excavated. When fully complete by 2029, the McCook Reservoir is estimated to provide more than $143M per year in flood reduction benefits to 3.1 million people in Chicago and 36 suburban communities. In only its first year, McCook Reservoir Stage I has made a major impact, taking on water a total of 39 times in 2018. More importantly, the reservoir captured 27.2 billion gallons of water during that time. If not for McCook, that 27.2 billion gallons of water could easily have polluted and overwhelmed area waterways and combined sewer systems and flooded streets, homes and communities. “I am so glad that I am able to play a small part in this innovative solution to improve water quality and alleviate flooding in Cook County.” said MWRD Commissioner Kimberly Du Buclet, chairman of the MWRD’s Federal Legislation committee. The TARP system, which is comprised of four large tunnels and three reservoirs, is unmatched in size throughout the world. The tunnels and reservoir are designed to reduce the amount of water pollution by holding untreated water until it can be cleaned at MWRD water reclamation plants. Area water quality has been improving since the tunnels went in service in the mid-1980s, and again in 2006 once the tunnels were completed. Since the 7.9 billion gallon Thornton Composite Reservoir was brought into service in the south suburbs in 2015, combined sewer overflows in area waterways have been nearly eliminated. In addition to the support outlined in the Project Participation Agreement signed by the MWRD and Corps, the project has also gained the approval of the Corps’ Great Lakes and Ohio River Division, the Corps’ headquarters, U.S. Assistant Secretary of the Army and White House Office of Management and Budget. Established in 1889, the MWRD is an award winning, special purpose government agency responsible for wastewater treatment and stormwater management in Cook County, Illinois. For more information, visit www.mwrd.org.